Among those of you who have been reading what's in the Canadian news lately, assuredly you have come across some of the 'Pastagate' articles coming from out of Quebec (see CBC News 'Pastagate' prompts review at Quebec language office). Stories about the provincial language police officers going into restaurants and handing out fines and warnings to establishment owners in regards to inadequate concessions to the sole official language of the province, French - and thus it has been since the Loi sur la langue officielle (Official Language Act) of 1974. Some of the more ridiculized recommendations made by the so-called French police include the more sensational charge against the use of Italian terms such as pasta, caffe, and botteglia di vino (bottle of wine). Recommendations to change these to their French equivalents pâtes (alimentaires), café, and bouteille de vin were made in order to accomodate provincial standards. This has, if anything, apparently served as an inspirational source of ridicule for media members here in Canada and from around the globe who have found the over-zealous inspectors of the Office québécois de la langue française (OQLF) comparable to that stereo-typified French Inspector Clouseau, as hilariously portrayed in the Pink Panther movies by actor Peter Sellers. A bumbling idiot stumbling over clues, Inspector Clouseau would only be able to solve a case by accident. 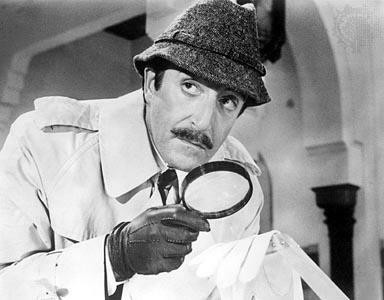 So was L. Ian MacDonald (in Montreal Gazette Feb. 26 article A new level of absurdity) wrong for having invoked this comparison between the OQLF inspectors and that idiotic Inspector Clouseau? On Saturday, La Presse columnist Yves Boisvert penned a scathing account of a recent visit by a singularly enthusiastic OQLF inspector to Holder restaurant in Old Montreal. The owner of the high-end brasserie, Maurice Holder, told Boisvert he was asked to cover up the “redial” and “hold” buttons on the restaurant’s phone with opaque tape, and to do the same for the “ON/OFF” button on the microwave. The last straw? Being ordered to take down the “W.C.” sign on the washroom door. The initials, which stand for “water closet,” are commonly used to mark bathroom doors in France, Holder pointed out to the inspector. “We’re not in France,” she reportedly replied. On Saturday, La Press columnist Yves Boisvert penned a scathing account of a recent visit by a singularly enthusiastic OQLF inspector to Holder [...]. The owner of the high-end brasserie, Maurice Holder, told Boisvert he was asked to cover up the "redial" and "hold" buttons on the restaurant's phone with opaque tape, and to do the same for the "ON/OFF" button on the microwave. [ ] The last straw? Being ordered to take down the "W.C." sign on the washroom door. The initials, which stand for "water closet," are commonly used to mark bathroom doors in France, Holder pointed out to the inspector. [ ] "We're not in France," she [the inspector] reportedly replied. Myself, as a francophone (albeit an Acadian one), with the utmost respect that I have for the OQLF in regards to their past efforts in promoting the use of French in Quebec, and the role they play in general in French Canada as far as linguistic conservationism is concerned (if that's what it should be called); with all this being said, I cannot help but think that this over-nationalistic pride in policing French, in the end, will be the root-cause or undoing of the Péquistes' mainstay on political power. Given the fact that over 80% of Quebec's population reports their native language as being French, one can then wonder why the need for language policing at such ridiculous levels. There is therefore no need to translate pasta in Montreal's finest restaurants, just as their is no real need to translate pizza. Fred Morin, left, and David McMillan outside their restaurant Joe Beef in Montreal. It seems “pastagate” isn’t quite finito. The controversy surrounding the Office québécois de la langue française’s objection to the word “pasta” on a Montreal restaurant’s menu continued to simmer over the weekend, with the owner of one of the city’s most famous eateries speaking out about his own run-ins with the provincial language watchdog. The inspector also apparently had a problem with an “exit” sign salvaged from a beach in Prince Edward Island. McMillan did take down the sign near the bathroom, he said, but last Wednesday’s flap involving the OQLF and Buonanotte restaurant — which used the word “pasta” instead of “pâtes” on its menu — convinced him it was time to take a stand.